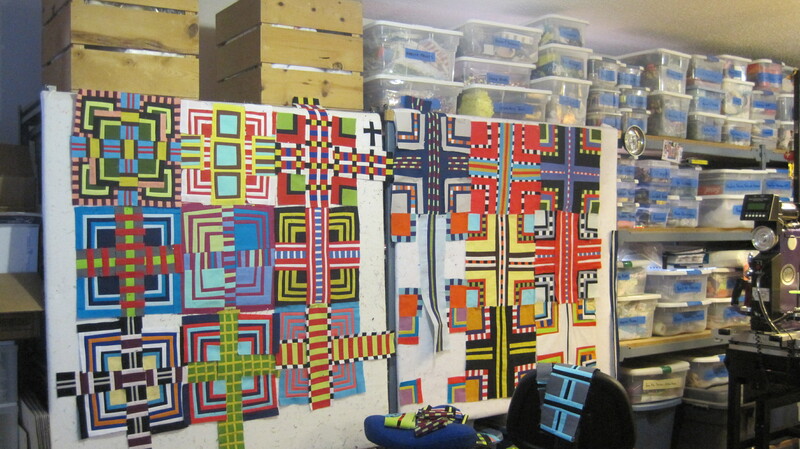 Last week in the post To the Studio, I wrote about all the quilts I wanted to finish in the immediate future. There are eight to be exact. This is the story of how TRIBE was finally finished. 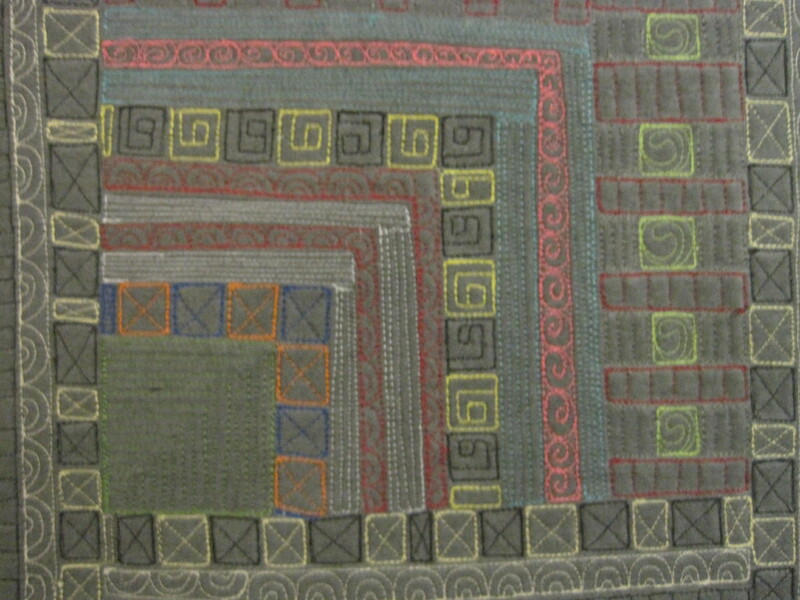 In the spring of 2011, I started playing around with these linear lines and square shapes aka as quilt blocks. I was making them all different sizes. Finally, I realized that if I wanted them to fit together, they needed to be closer to the same size. I know this seems like a simple realization. Sometimes, I think my right brain takes over and refuses to acknowledge the left brain might have something important to say. I become so immersed in the process that details like SIZE MATTERS elude me. Once I figured that out, I began to create blocks that fit together. These blocks were created using lines on my cutting mat and the straight edge of my ruler. I wrote about this process here and here. Working this way, allows for the lines of the block to have character while still fitting together. 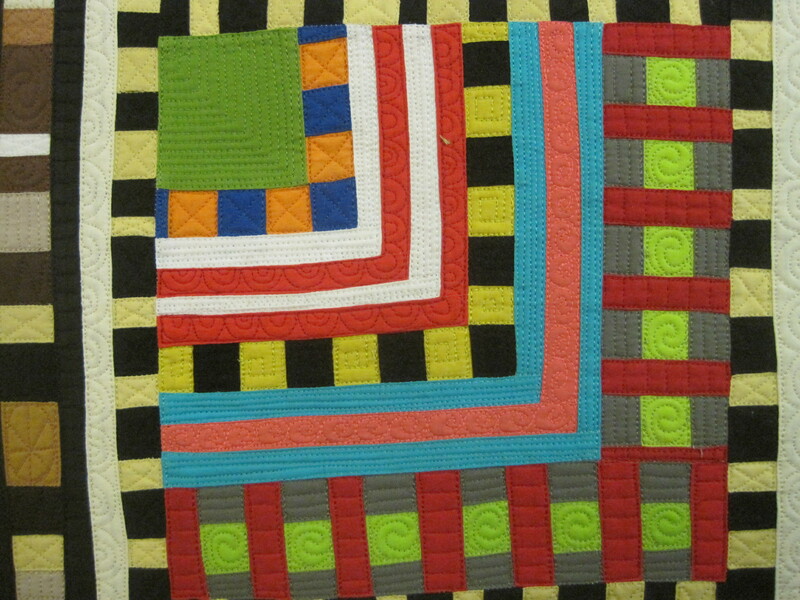 Some of these blocks really wanted to be quilts all by themselves. Way to Grace’s was one of those blocks. 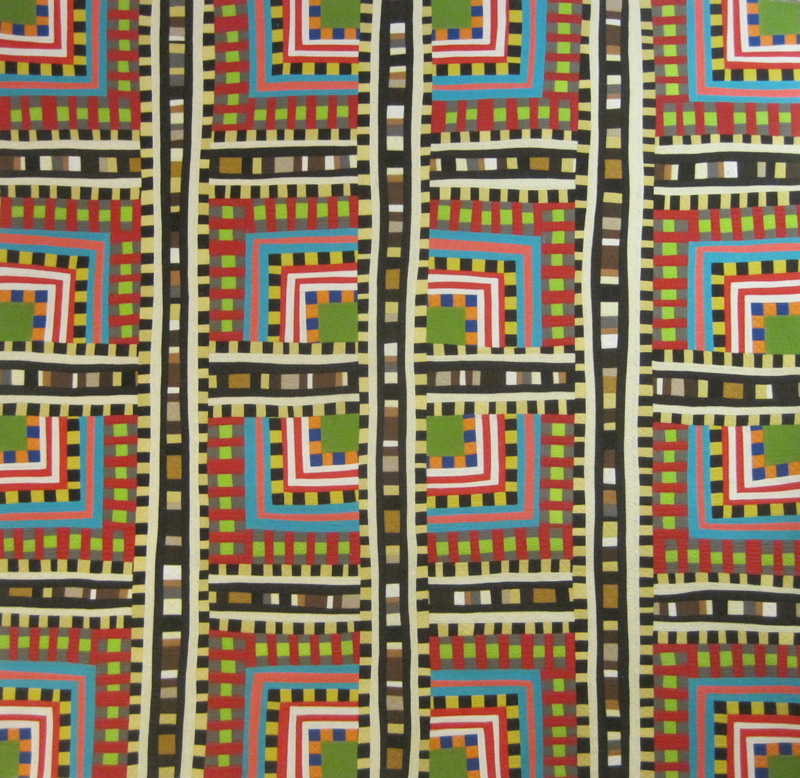 In fact, I liked the colors, pattern, and repetition of this block so much I used it again in Boulevard. And then I had a eureka moment. Why not repeat the block out and see what happens then? You know, like, in a quilt. This really simple idea has resulted in 20 completed Color Grids. You can see all 20 on my website. 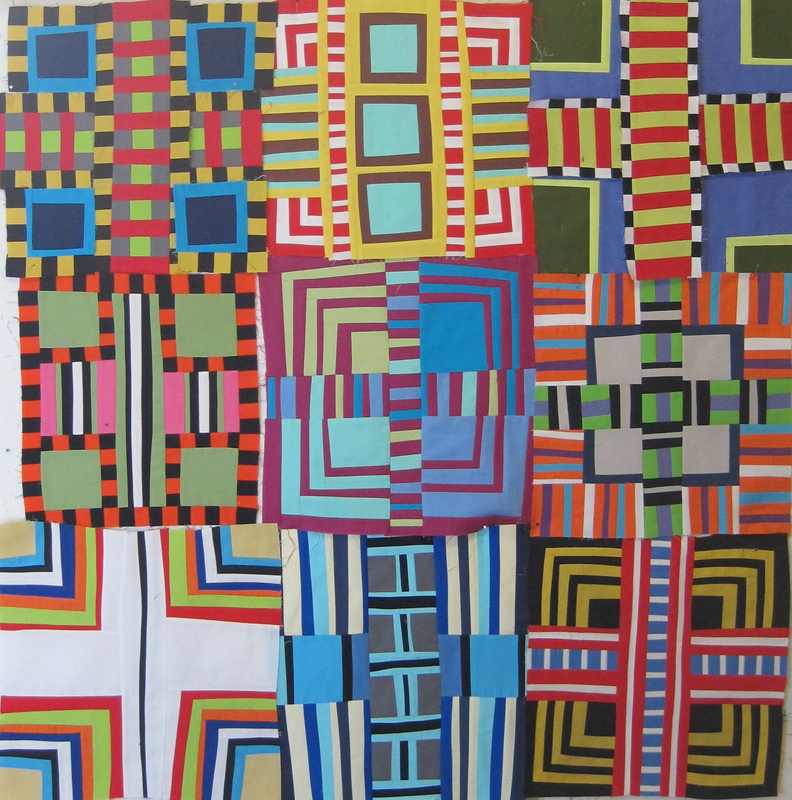 According to Barbara Brackman’s Encyclopedia of Pieced Quilt Patterns, my Color Grids are related to the following quilt blocks–The Red Cross Quilt, Stone Mason’s Puzzle, City Streets, Crossed Square, and my favorite, Squares and Square. This was a very exciting time for me in my studio. 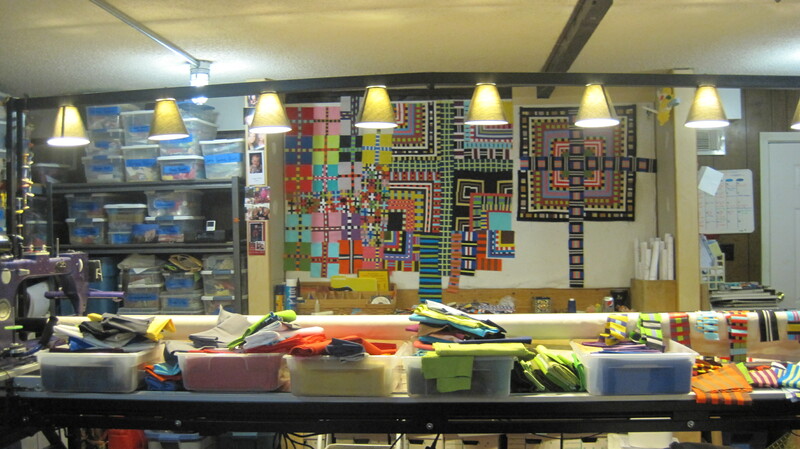 I was working on about six quilts at a time. Every day I would cut, cut, cut. And then stitch, stitch, stitch. And finally press, press, press. Then I would throw it all up on the design walls to see what I had. My studio was in complete chaos. Since then, Walt and I have reconfigured my space–it is now much more elegant and functional. This was before I had the show commitments that I now have. At that moment, I so wanted the recognition of having a solo show or being a featured artist. And I still want that. But I do long for those days when I just went into my studio and went crazy–there were no real deadlines back then. Then I went to study at the Crow Barn, summer happened, and two large commissioned community quilts needed to be finished. I did not get back to TRIBE until the following spring. I should have taken more photos in progress. I wasn’t a bloggist yet. Bloggists think about taking pictures. Here is my only in progress photo. I finished the top of TRIBE on August 4, 2012. 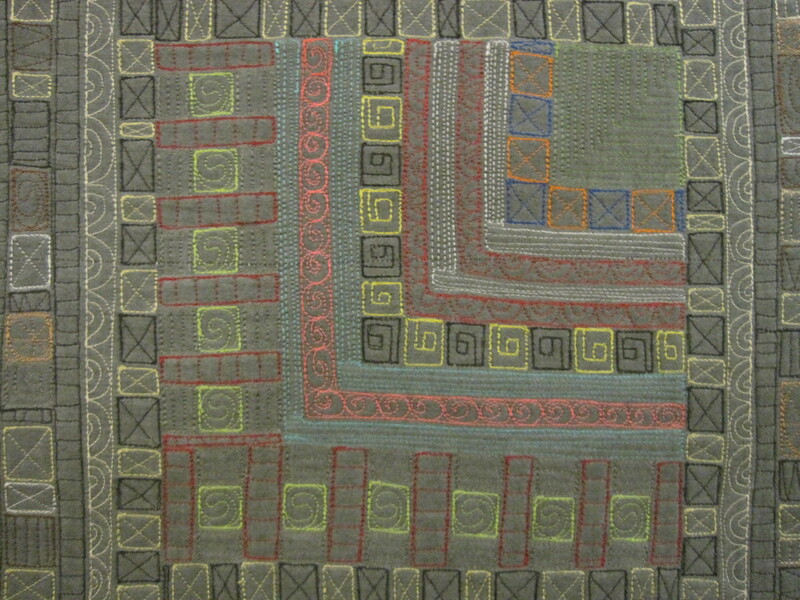 I was hoping to use it as one of the nine quilts in the Bellevue Arts Museum exhibit High Fiber Diet. But it was too big. Once again, my right brain was not listening. 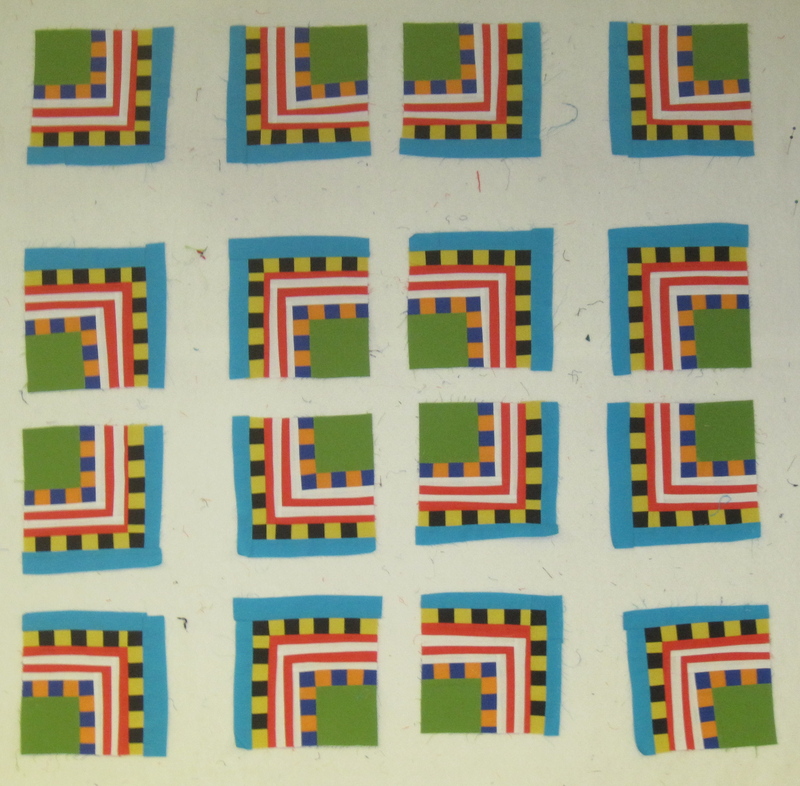 In order for nine quilts to read as a grid, they need to be the same size. Tribe was too big and went back in the storage bin. Fast forward to January 2014. I am in finishing mode. 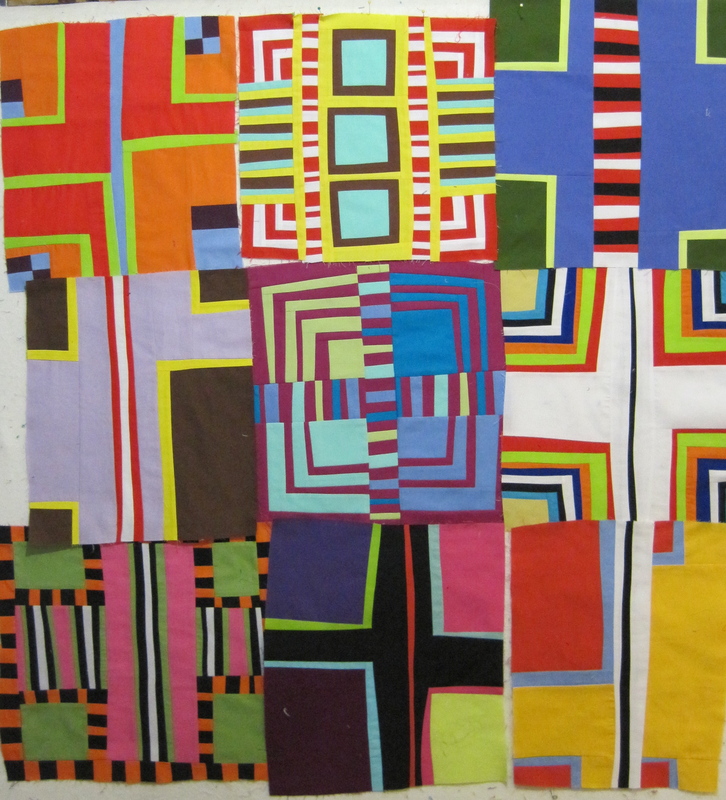 Of the eight quilts I want to finish in the near future, TRIBE is by far the most difficult to quilt. 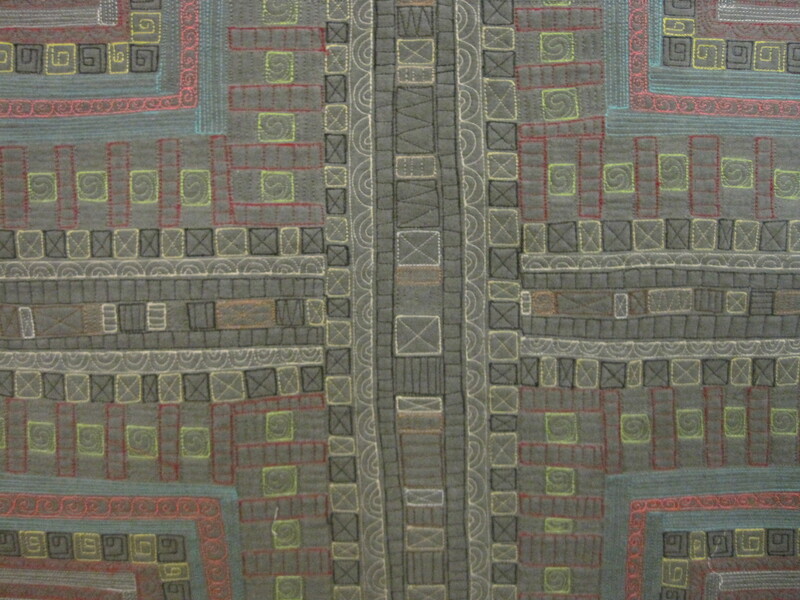 There have got to be more than a 1,000 pieces in this quilt, and each one has to be individually quilted. This means tying off my thread more than a 1,000 times. 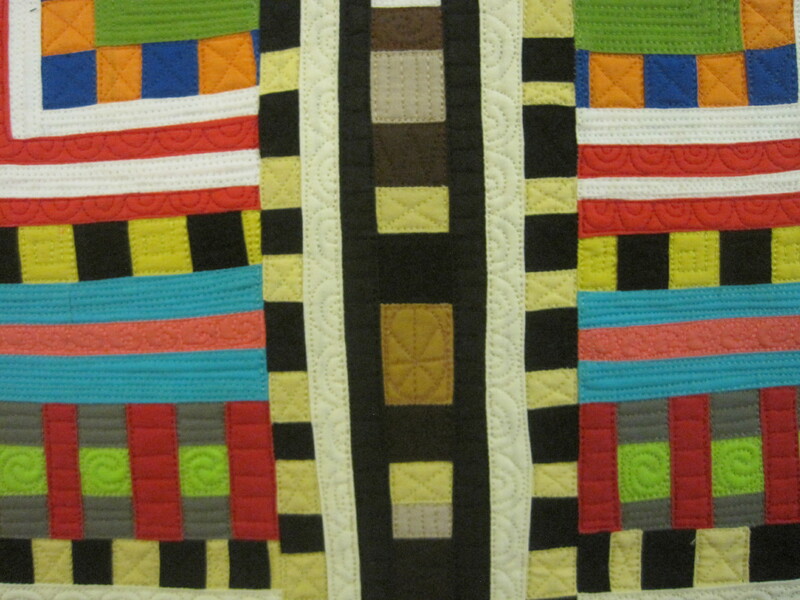 I do not bury my threads, but I do define each individual space by quilting around it twice. I like how this looks. I think of my backs as the negatives of my quilt–as in photo negatives. The back is where the quilting gets to be the star. I use shot cottons for my backs. I believe it hides and hi-lights my work. 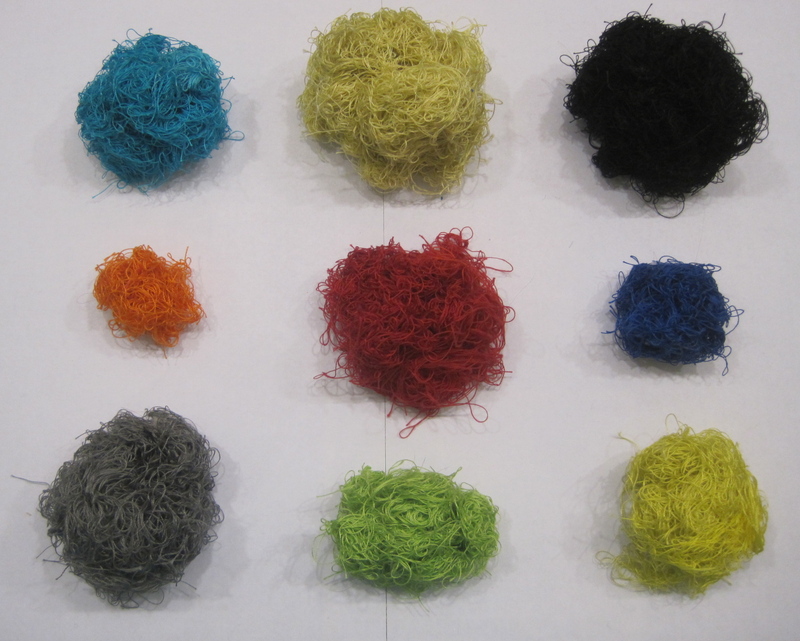 Here are some, but not all, of the thread remains from tying off so many times. 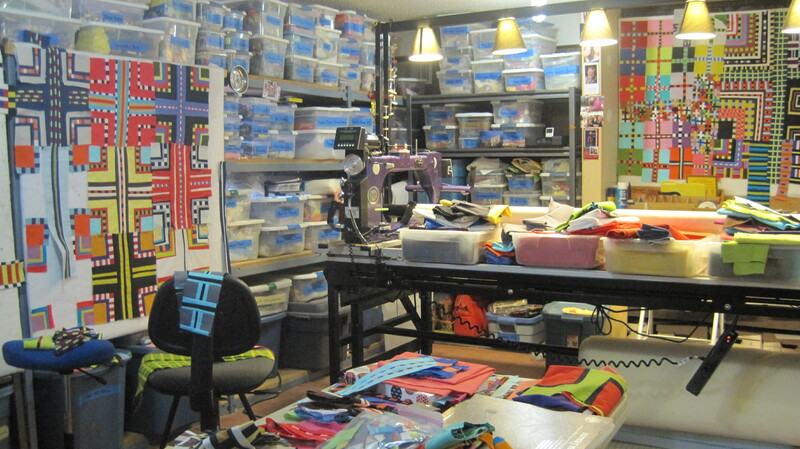 It took me approximately 45.5 hours on my long arm quilting machine to finish TRIBE. It feels very good to have completed such a large and complicated piece. 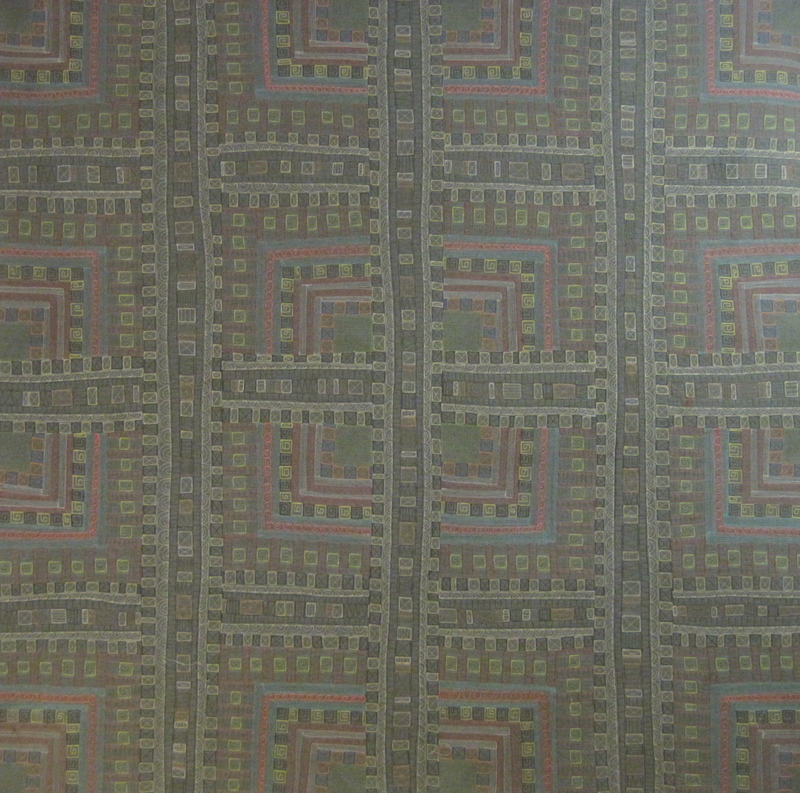 Each color has its own quilted motif. 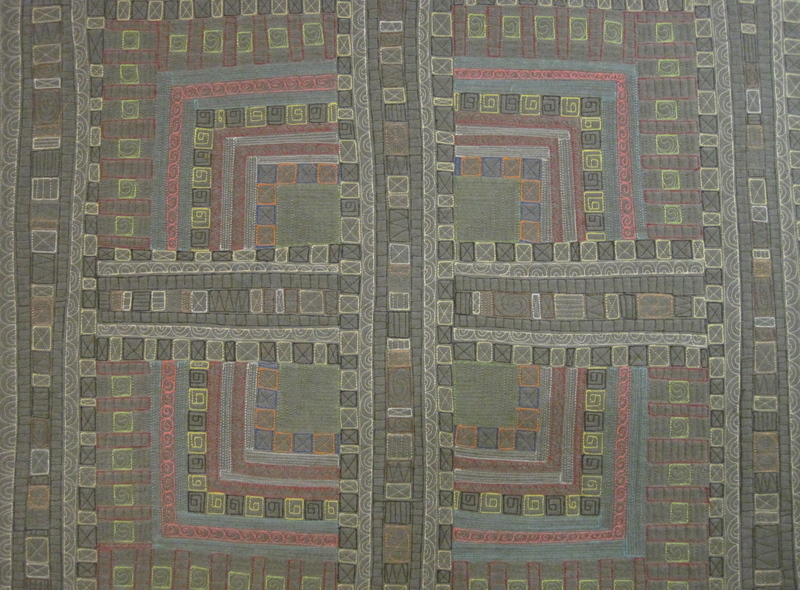 The final quilt measures 52H x 52W. I know some of you are mystified by me putting this much work into a single piece. And while I am quilting, I have my moments of doubt. But when it is done. It is DONE. And that is a wonderful feeling. I hope all of you have relaxing and creative weekends ahead. I’ve shared this post on Nina-Marie’s Off the Fridays where you can see what fiber artists from around the world have been doing. 10 Jan	This entry was published on January 10, 2014 at 12:15 PM. It’s filed under Quilt Stories and tagged TRIBE. 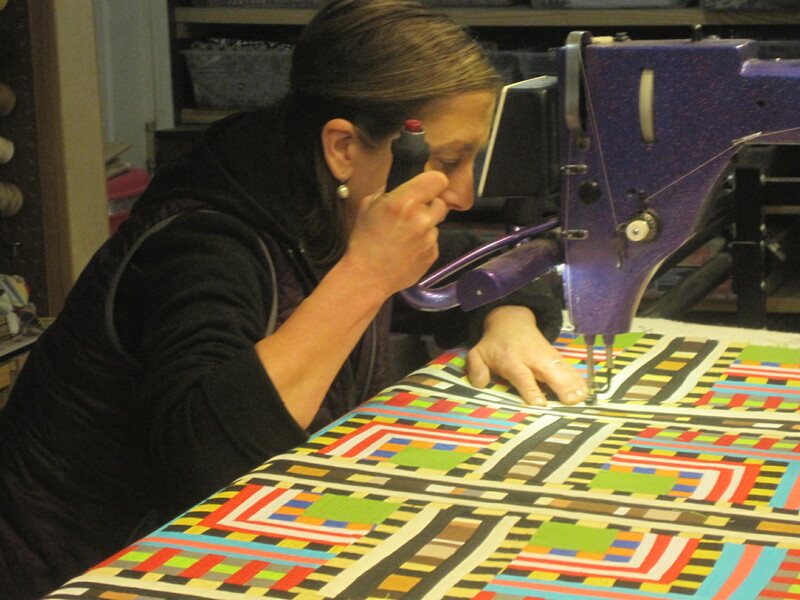 Long Arm Quilting. Bookmark the permalink. Follow any comments here with the RSS feed for this post. It’s GORGEOUS, Maria. A labor of love! Thanks you Julie. It was a labor of love for sure. I’m curious how you bind/face your edges? I can’t tell from the photos. Sharon-I knew someone would notice–but I was ready to write that post, so I just did it. It is all good. Do you tie all those ends by hand? And if you don’t bury them, are there pretty little tufts all over the back? I do not bury or tie my ends. I stitch around everything at least twice which is basically like backtracking on your sewing machine, but because I do it everywhere it looks, I think, good. I then clip the thread as close as I can. Have you tackled any of your projects yet? Love the scissors–an absolutely essential component of tackling! Thanks for sharing all of this! When you say you stitch around everything twice, is that two times ‘in the ditch’? or once in the ditch, and then the design motif, such as a spiral? Lauren-I stitch around the “ditch” twice. Although I don’t really stitch in the ditch. I stitch on the hill which is basically top stitching. I find that I can consistently do that. In order to consistently stitch in the ditch you have to have all ditches which isn’t possible. Thank you for the question and for stopping by. I hope you are having a good and productive January. 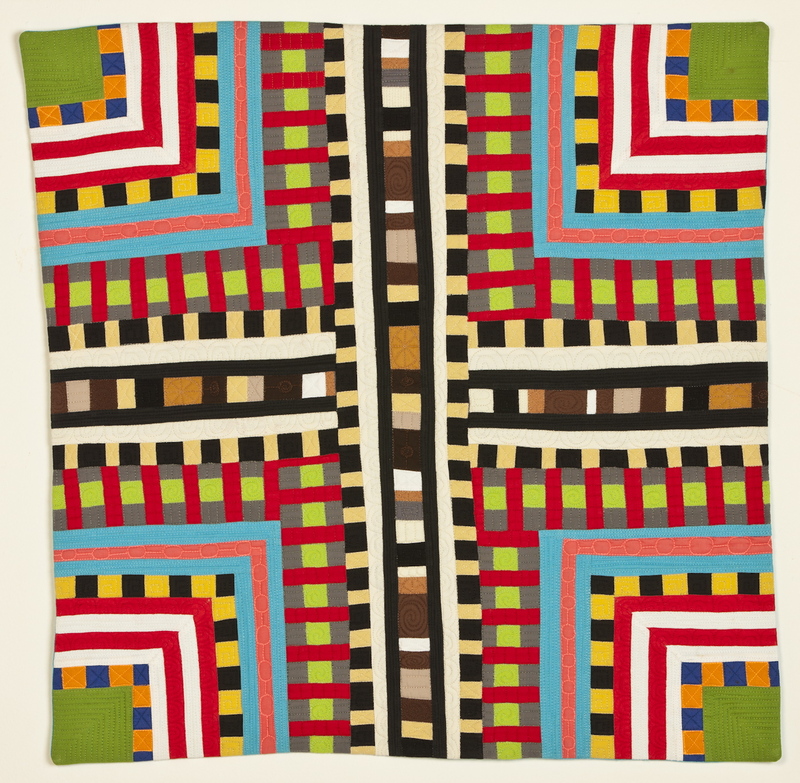 This is a rare and beautiful quilt. 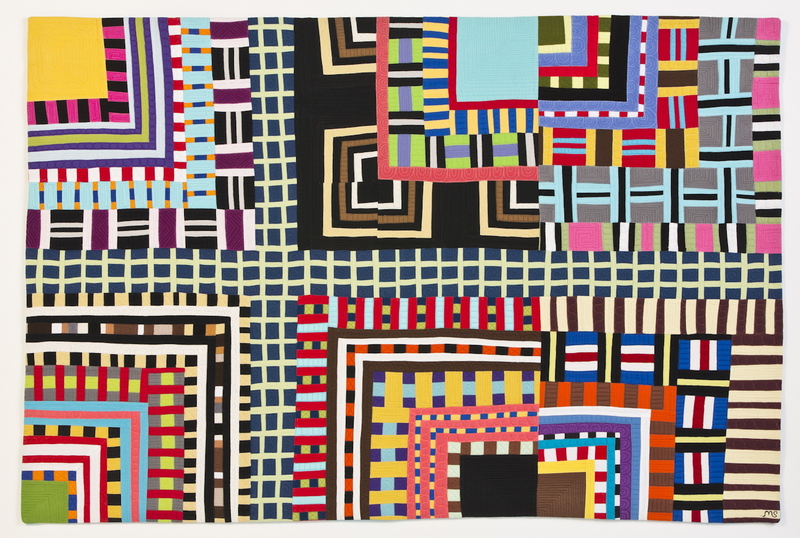 It puts me in mind of Nancy Crow’s early work but is much more sophisticated.Quilting is the only part of life where we get to do exactly what we want with impunity. You go girl. Thank you Gail. That is a wonderful thing for you to say. Thank you very much. 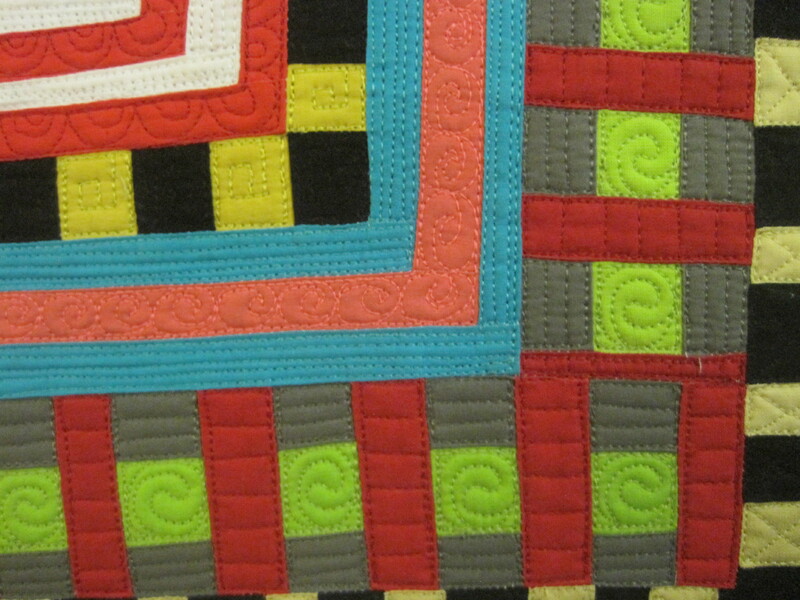 I’m with you on the quilting–its our quilt so we get to pick the the quilting.